Large shaped ergonomic seat, padded headrest & leg openings, ability to cross straps across back. The worlds most advanced baby carrier system. 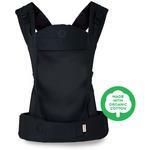 With its amazing easy-to-use features, improved ergonomics, elegant and intuitive design, the Beco Soleil Baby Carrier System is the answer to all of what modern parents are looking for. Shoulder straps adjustable from 23" - 42"
Padded waist belt adjustable from 28" - 60"
ALL FOAMS ARE FLAME RETARDANTS FREE. Packaging: 100% recycled content. Printed with soy based inks. Infant Insert is a specially designed seat-like piece to support newborns from 7-15 lbs inside of the Soleil Baby Carrier. The insert provides additional head, neck and bottom support. 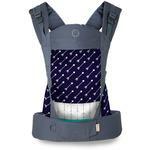 Soleil Baby Carrier can be safely used with infants 7 lbs+ also without infant insert. 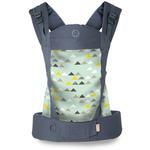 Simply attach these awesome pads on the carrier shoulder straps and let your baby to drool away happily!